Gardenia jasminoides growing shrub‎ of the genus Gardenia also known as Cape jasmine, Gardenia jasminoides perennial evergreen used as ornamental fragrant hedge plant or medical plant, can grow in subtropics, tropics or mediterranean climate or as houseplant and growing in hardiness zone 8+. Leaves color dark green glossy in oval shape. 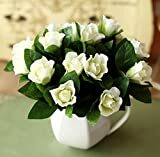 Flower fragrant color white, with 6 to multi petals with yellow stamens. 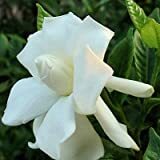 Gardenia jasminoides Chuck Hayes HARDY GARDENIA Seeds! White fragrant flowers, with 6 to multi petals with yellow stamens.